Nobody reading this will need reminding that Watford’s first (and to-date only) foray into Europe began in Kaiserslautern in September 1983. 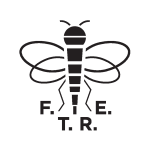 The 1.F.C. Kaiserslautern of today are a yo-yo club in the Bundesliga, so it’s easy to forget that this was a side that had murdered Real Madrid on the way to the semi-finals of the same competition two years earlier, and disposed of Napoli and Sevilla before a quarter-final exit the previous season. No easy tie this, for a Watford side missing seven first teamers and already struggling to overcome the loss of the previous season’s forward line over the close season. We had emigrated to the south of Germany in the April, days after a 5-2 win over Luton but before the win over Liverpool which was a much bigger deal at the time than it would be now, end of season slump or otherwise. 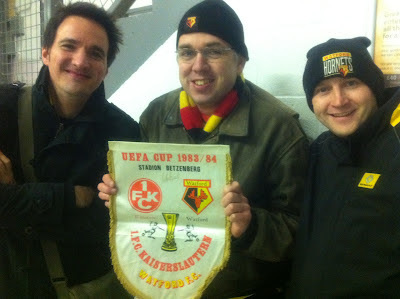 In the wake of listening to that one on World Service, my Dad boldly and perhaps recklessly proclaimed that we would be at the first UEFA Cup game, whether it was in Watford, Norway, Greece or wherever. He got lucky. Very lucky. Kaiserslautern was about 50 miles away. I was 10. It was my first away game. All the things that are still insanely exciting about midweek football – the dark, the chill, the lights, the claustrophobia of the whole thing – were amplified by the significance of the occasion. The camaraderie in the stands still stands out as a memory, although I did remember feeling that by living nearby we had somehow cheated, that we were less worthy than those who’d made the trip. Another interloper who had made a slightly more straightforward trip than most in the away end was AC Milan’s new striker Luther Blissett, affably munching an apple in the away stand and perfectly happy to sign my commemorative pennant. I suspect that it wasn’t the only one he signed that night, but I wonder if others have survived the intervening 29 (NB NOT 30) years. As pennants go it’s a hefty beast; sadly the balsa plinth and yellow cotton from which it hung have not stood the test of time but the pennant itself remains pinned to my noticeboard in pride of place next to the Cup Final rosette. It merits entry in this list as testimony to surely the greatest achievement of that Watford side, the second place finish in 1983.